Growing up, every family gathering during the months of September to January included my grandmother’s apple pie. I would help her pick and peel the apples, she would bake. She made rolling out the crust look like a breeze. And when it came out of the oven it was always perfectly browned, with flakey layers made possible from a heavy dose of butter. The top glistened with sugar and a little egg wash, a caramelized glaze stuck to the sides from the juices that escaped. 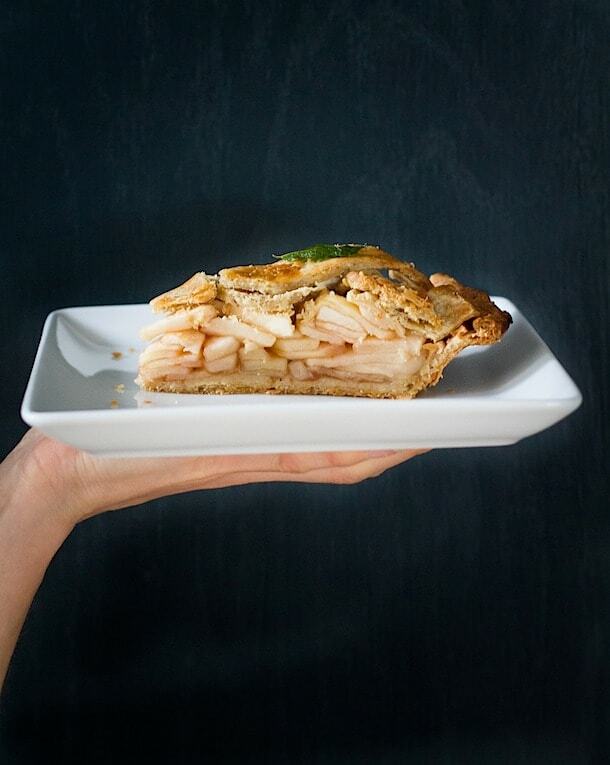 Those sweet memories flowed through my mind as I made this homemade gluten-free apple pie, with a lattice-top crust and SnowSweet apples from my favorite local orchard, Whistling Well Farms. Admittedly I felt proud as I took it out of my (NEW!) convection oven, the classic cinnamon sugar scent covering me like perfume. Similar to how everyone fought over the first piece of my grandma’s pie, I fought with myself to resist a bite before I photographed it. Just like a cake, you can usually tell much of your success/fail ratio when cutting the first slice. I wanted to rejoice as I felt the knife slide through the crisp crust and hit the bottom. 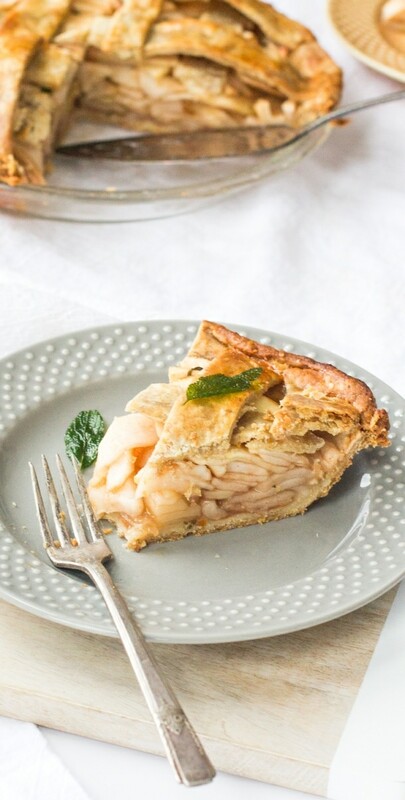 The crust hadn’t gotten soggy, and the leisurely bake had given the highly stacked apples a tenderness, with jammy pockets of their own juices. Although the crispy sage that I used for garnish is optional, I think it adds such a beautiful touch. 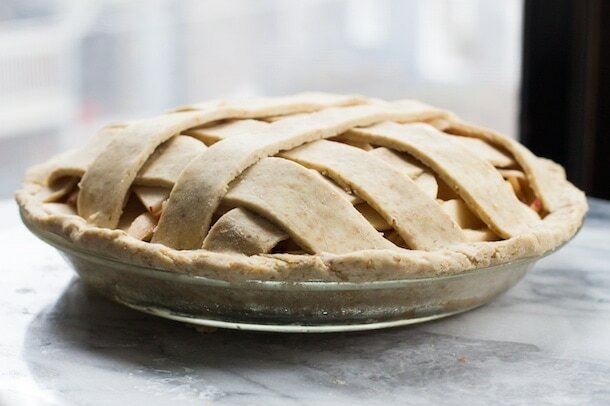 Pie crusts can be intimidating even though they’re made from just a few ingredients. Getting them to roll out evenly, not fall apart, turn out buttery & flakey – there’s a lot of components. Then throw gluten-free into the mix and it can seem even more difficult. Last spring I made gluten-free rhubarb hand pies, which certainly helped me get over some of my fears, but its not the same as making a whole pie. Armed with a little research and the gluten-free flour blend that never lets me down, Cup4Cup, I set out to conquer an all-butter crust complete with a lattice crust. It’s the gluten-free flour I always have at home and what I used throughout my book. So when Cup4Cup asked me to partner with them for autumn pie inspiration using their new Wholesome Blend, I was excited to create something for you. This new blend is wonderful: full of nutrient dense flours, dairy & corn free (I know many of you had been asking for that) & non-GMO. Think of the Wholesome Blend like you would whole wheat flour, hearty and nutritious. It’s made from brown rice flour, white rice flour, golden flaxseed, rice bran & xanthum gum. 1. More whole grains in this blend means more fiber. Fiber acts as an absorbent, so you’ll always need a little more liquid or fat when baking with it. That being said, for the crust I used honey instead of sugar and a little more water than what you would typically use. 2. Leverage is key for rolling out the dough. Even though I’m quite tall, it helped immensely when I got on a stepping stool and was able to take control of the crust. 3. Gluten-free dough is stickier, so always line your counter with saran wrap, dust it with flour. Then put your dough on top of it, followed by another sprinkle of flour, followed by saran wrap. Then you’ll be able to roll it just like your grandmother did. 4. I know you’ve heard it before, but all crust ingredients should be ICE cold. This helps the butter stay firm so those fats can expand and create air bubbles when baked, which is where the flakiness comes from. Also, use the refrigerator and freezer to your advantage when working with the raw crust. When it’s cold, its much easier to work with. 5. Don’t mix your fruit (apples in this case) with sugar & cornstarch too far in advance of filling the crust. Since sugar pulls out the liquid in fruit, you will end up with too much water, resulting in a soggy crust. 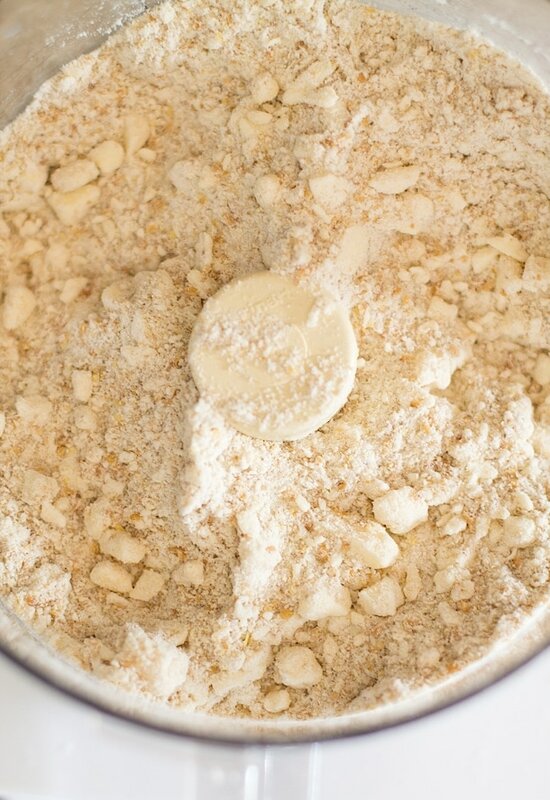 Add flour, honey and salt to food processor. Pulse a couple of times to blend. Then add cold butter and pulse until most of the butter is the size of peas. It’s okay if you see a few larger chunks. Remove food processor base and stir water in by hand (I like to save on dishes so I don’t use another bowl, but you could). Dump the scraggly dough onto your counter and work in together with your hands to form a tight circle. Flatten the circle, wrap in saran wrap and place in refrigerator for at least one hour, up to overnight. When chilled, divide the dough into two equal pieces. Line your counter with saran wrap, dust it with flour, then put your dough on top. Sprinkle top of crust with a little more dough, cover with large piece of saran and roll out into a large circle that will fit your pan. Remove saran and gently lift into pie pan. Use THESE amazing details to make your lattice top – thanks to The Kitchn for always being such a wonderful resource! If you make this Gluten-Free Apple Pie recipe, tag me on Instagram @heartbeetkitchen, or using hashtag #heartbeetkitchen! Preheat oven to 400 degrees. Make pie crust above, put bottom crust into your pie plate and set in refrigerator. Cut peeled apples into thin wedges and put into a large bowl. Stir in lemon juice. In a small bowl, combine sugar, cinnamon, ginger, cornstarch and minced sage. Add this mixture to the bowl of apples and stir to coat. Dump into pie plate with bottom crust. Top apples with the lattice strips that you have made, following instructions linked to above. Bake pie on the bottom rack for 7 minutes, then move to the middle rack, placing pie on a metal baking sheet to catch spills. Reduce heat to 350 degrees and bake for additional 40 minutes or until juices are bubbling and crust is nicely browned. Then remove from oven and let rest for 1 hour on a wire rack. (About midway through baking, put a foil lining around the edges of the crust to ensure that it does not burn.) Remove at this point. If you want the crispy sage for a pretty garnish, heat about ½ inch of oil in a small saute pan over medium high heat. Add clean sage leaves and fry until crispy, about 3 minutes. Pie will keep for 3 days (do not refrigerate or will turn soggy) or you can freeze it. We are just starting to bake gluten-free at our house. This pie looks FANTASTIC. 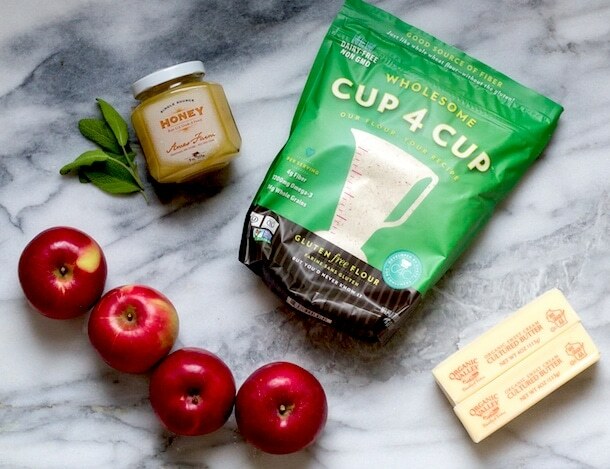 Looking forward to trying the “Cup4Cup” flour. Thanks for the tips. Kelli, I was so impressed with this wholesome blend. I love how it has all the nutrient dense flours. And Cup4Cup makes gf baking quite easy so I’m confident you will be successful! My grandmother made wonderful pies and she would be heartbroken if she knew I couldn’t eat them now. I am definitely making this gluten-free crust with some of her pie fillings. I so miss my grandma. 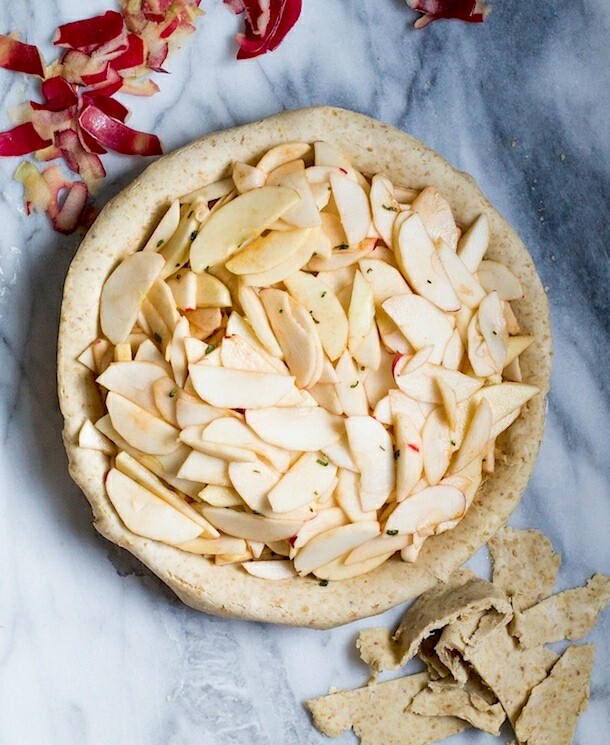 A decent pie crust that’s gluten-free?? I’m all in!! :-) Beautiful pie, my friend. Thanks friend :) I’d share a piece with you any day! This looks amazing! I will definitely by trying this! 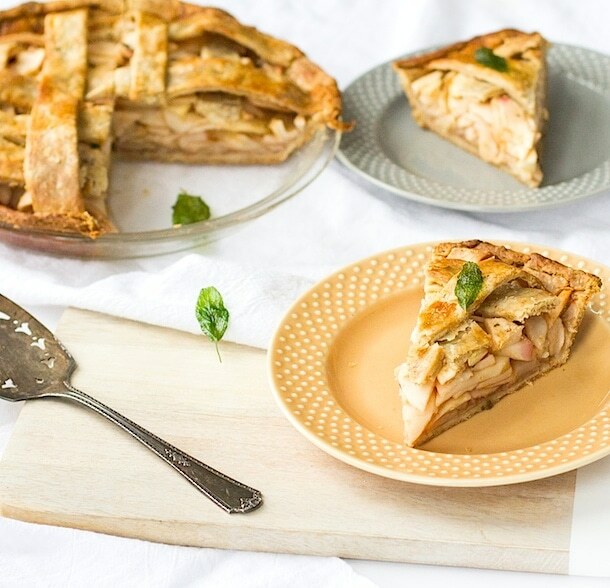 I’ve been looking for a better version of apple pie to make for thanksgiving. I’ll definitely be trying this recipe! congratulations on an epic gluten-free pie victory. it’s beautiful! i’m sending you a fellow tall lady high five! my only tip for crust making (not very good at it…): don’t forget to flour the surface! You can do it Yoojin! And usually it still tastes good right? Excellent tip. i wanna try this flour blend SO BAD!!!! that crust looks insanely perfect. i ruined a crust today by (accidentally) omitting starches and binders (laughing at myself about it now). SO. yeah. 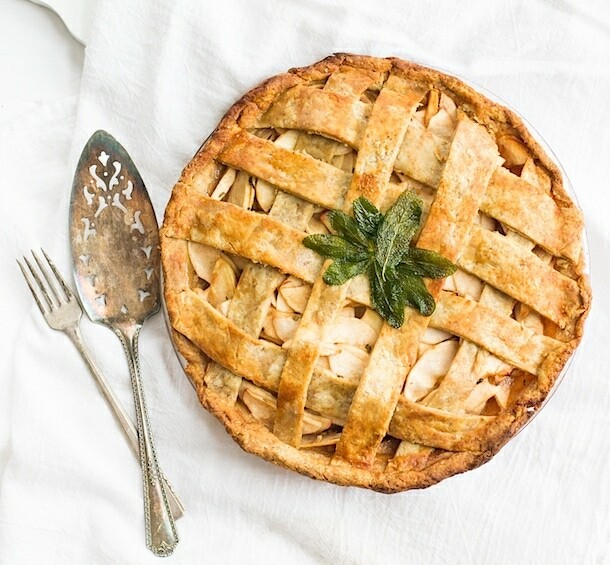 Amanda – this apple pie looks like it belongs in a magazine. The stack of apples held up perfectly under the lattice top and didn’t sink at all! I love hearing about your memory of picking and peeling the apples with your grandma too. I’m VERY excited about this new wholesome blend. I love the regular cup4cup, but I always use it sparingly because of the cornstarch. This new rice-based one sounds right up my alley! My tip for making a perfect pie crust? Don’t overwork the dough – make sure there are still pocket of butter to leave it just a bit flakey when it’s baked. I always cut the butter into tiny cubes, then pop those into the freezer for 5 to 10 minutes before cutting into the flour with a pastry cutter. Following a couple diagnoses of Celiac disease in our family, I’ve been experimenting with more GF recipes. 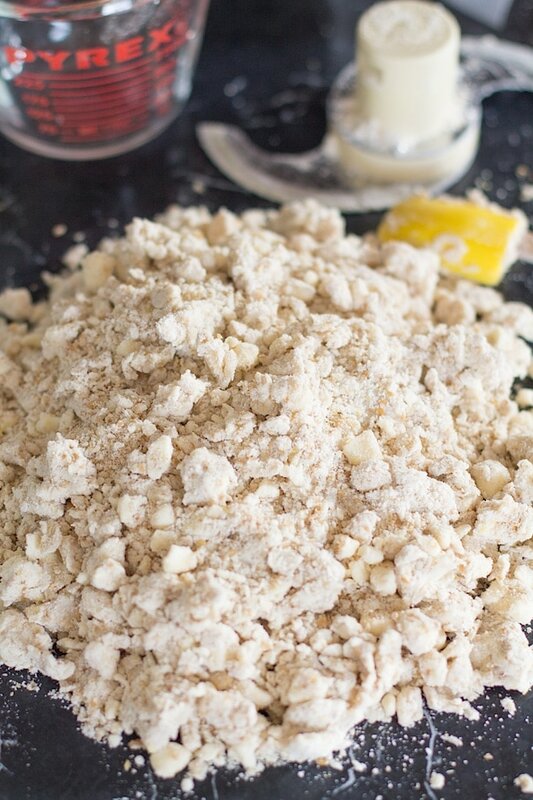 Pie crust isn’t one I’ve yet attempted, and look forward to trying this + your tips. Thanks! Look forward to the opportunity to use any product that is gluten free. Can’t wait to try this apple pie. My grandmother always told me to add a bit of white vinegar to make it tender. Brittany I’ve never heard of that trick. I will have to give a try! 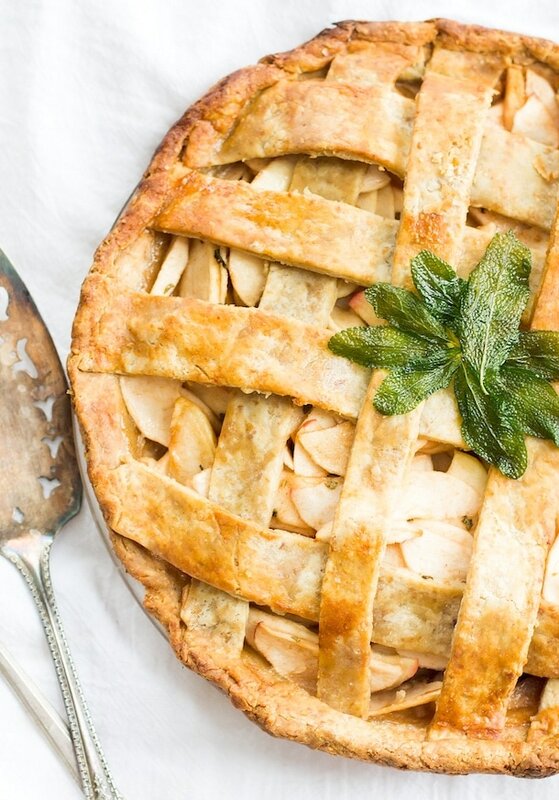 What a gorgeous apple pie! We add a little bit of vinegar in our recipe to make a flaky crust! It was wonderful to hear you on the weekly dish. 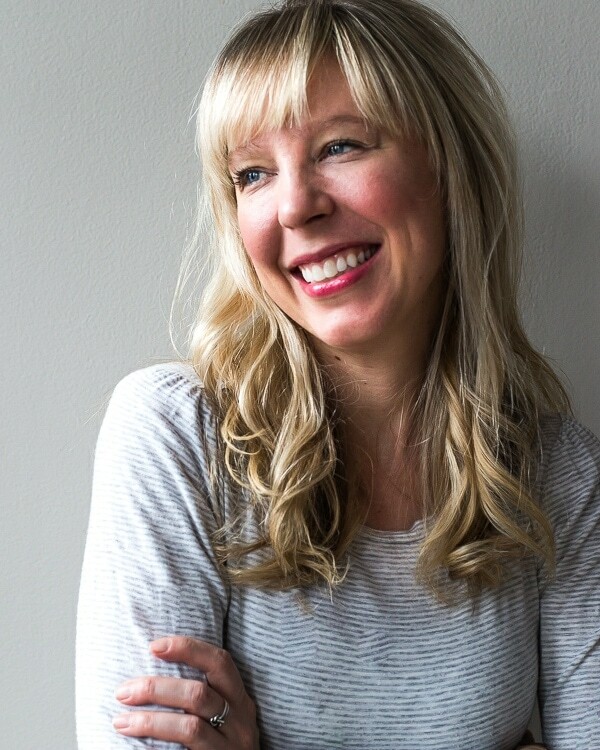 I can’t wait to read more on your blog I’ve been gluten-free living in the Twin Cities for over seven years. It’s nice to see a fresh face or fresh fresh ideas gluten-free. Thank you!! Honestly, I don’t really have any tips beside look to others, such as yourself, for tips! I am not a great baker rather just getting into it. I am more of pinch of this, pinch of that sorta gal but as gluten free eater, I am always looking for new ways to make my favorites! Thank you so much for these tips. I will definitely incorporate them into my baking. And this Cup 4 Cup flour blend. I have been eyeing it for far too long but need to give it a try! What a beautiful pie, Amanda! I love the lattice top and the honey in the crust, and your cooking tips look so helpful. Crusts are definitely daunting and it’s nice to find a well-tested recipe like yours. Tis the season to be in the kitchen baking pies! Chill the dough is the trick that works the best for me. Your pie looks so yummy! Amanda this pie looks perfect! I’ve been itching to try Cup-for-Cup. You have officially convinced me I must! Yes Kara! They’re so great to work with. Thanks for stopping by! One good tip for a great crust is to make sure all your ingredients are cold especially the butter and any liquid you may use like water. I use Coconut Oil in place of butter and it makes the flakiest crust. Fran I will definitely have to give that a try! LOVE this blog! Just wish it didn’t come through Feedburner- would love direct email! My dad has celiac disease, so I try very hard to make EVERYTHING with Cup4Cup (the best flour ever) and 95% of the time I am successful. However, I have NOT every been successful with pie dough- but I will study the tips carefully and attempt to make this beautiful pies. I will continue to follow this new discovery… heartbeetkitchen.com! Hi Pascale! Thank you so much for stopping by. So great that you use Cup4Cup already! Pie dough can be tricky but hopefully the tips in this post will help. Also, I do have an email subscription so you don’t have to use RSS. It’s located right underneath the Popular Recipes section on my sidebar. Just enter your email and confirm. Thank you! I love new recipes that are GF. I was just recently was diagnosed with Celiac Disease and being a chef has been a strange combo. I’m having to relearn baking concepts and your blog has helped with this. Don’t be tempted to add too much water, and don’t forget to chill the dough! I’m so excited to try this recipe and brand of flour. Thanks for the tips and the giveaway! I don’t have any tricks, my crusts always come out too dry – but all these tips are great! Hi Jessica! The one thing with gf pie dough is to make sure the butter stays in small chunks which will help it from drying out. And if you need to add a little more water, that’s totally okay. Thanks for stopping by! I’ve always been lazy (and spoiled) with premade pie crusts, though harder to find now that I’ve gone gluten free. 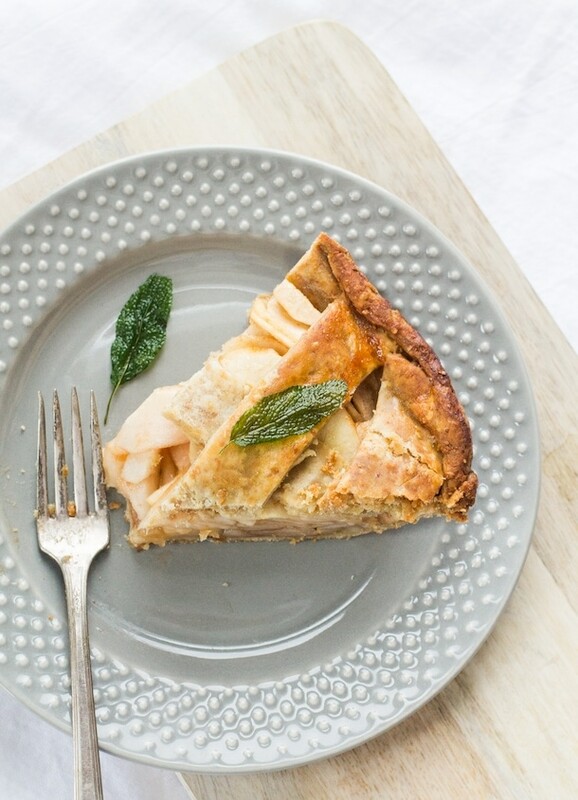 This pie looks amazing and I’ve been eyeing cup4cup flour for a bit. I’m sold! Brushing egg on top of the crust, then sprinkling with sugar! Oh that’s a great idea! It would make the crust glisten even more. i’m craving it right now with a big dollop of vanilla bean ice cream :) thanks for stopping by Lauren! I made this pie yesterday, but instead did a regular top and brushed it with egg wash. It was absolutely perfect! I got so many compliments! GF Baking never works out for me, thank you so much for this recipe! oh awesome! i’m so glad you liked it. i can’t wait until apple season here in minnesota to make it again! Can I use my favorite gf flour for this if it’s not cup4cup? I haven’t test this with other gf flours, so I’m not certain because depending on which gf flours are in your blend, they could react differently to the amount of liquid etc. This is because all gf flours are different in weight and scientific properties when baking. But you could certainly give it a try. Best Apple Pie Recipe ever. I ordered the flour and made this recipe with erythritol for added sweetness instead of honey, and it turned out fantastic. The crust that this flour makes if phenomenal, and I will be using this flour from now on. Thank you for such a great recipe. I made 2 of these pies for Thanksgiving, and one of the 12 year old boys could not get enough. I️ don’t have any way to measure grams. What is the amount in cups.?? it would be 2 cups + a scant 1/4 cup. so a little less than 1/4 cup.